My friend recently had a baby. It was the perfect excuse to use a new toy that I got for my birthday. Silhouette has to be one of the hardest words to remember how to spell. That and colonel. This thing is really fun to use. I also got the Fabric Ink Starter Kit to go along with it. I made some simple and pretty quick onesies for the new baby. He'll be the hippest baby on the block. 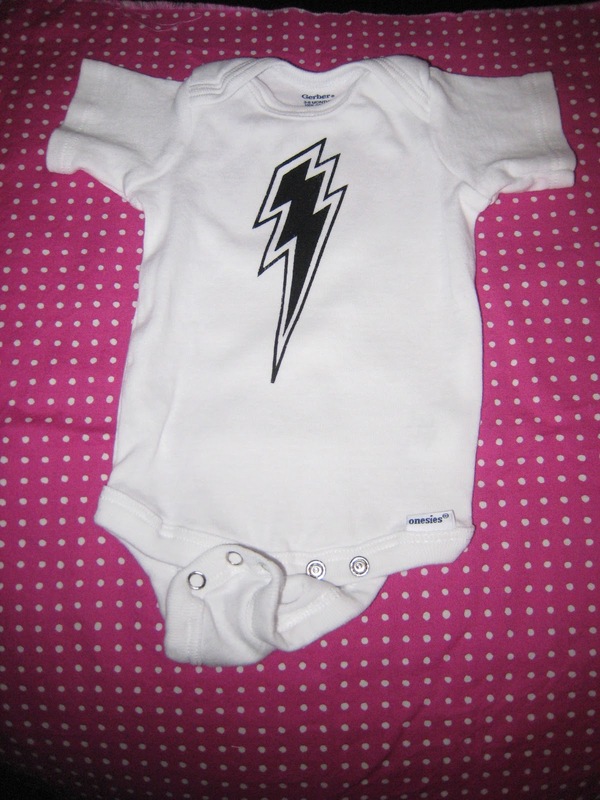 Then I used my Silhouette to make the stencils and transferred them to the onesie. Next time I want to use colored onesies. I found a website with some cool colors (solid colors with no embroidery or anything were surprisingly hard to find): Rock Bottom T-Shirts. The other option is some good old fashioned Rit Dye. I'll also be getting some different colored paint too...I see a lot more fun baby projects in my future. Those are cool! Great Job Megan. Thanks! I'm excited to try different colors too!